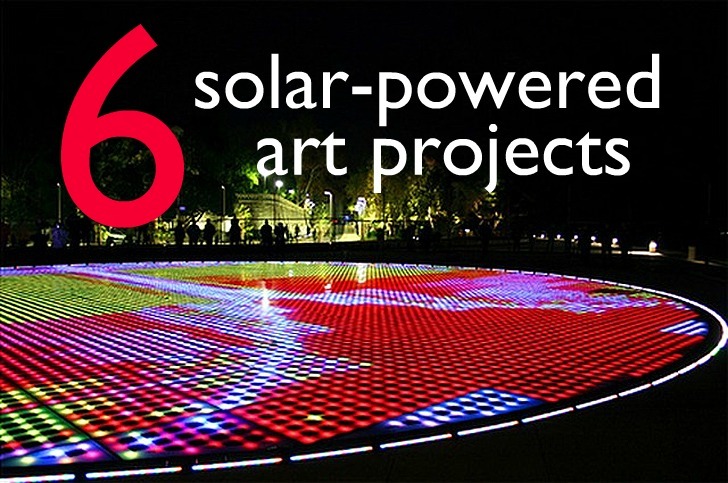 If you're looking to escape the drab walls of your cubicle today, why not take a trip into our gallery of 6 dazzling solar-powered sculptures from the Solar Artworks Project website? We learned about this project via the Land Art Generator Initiative folks, who are currently visiting with SAP's founder Nacho Zamora, who "specializes in the study and documentation of interdisciplinary and renewable energy artwork." Hit the jump to check out 6 of Zamora's amazing finds that will give you a small taste of what happens when artists turn to the sun to power their creative works. 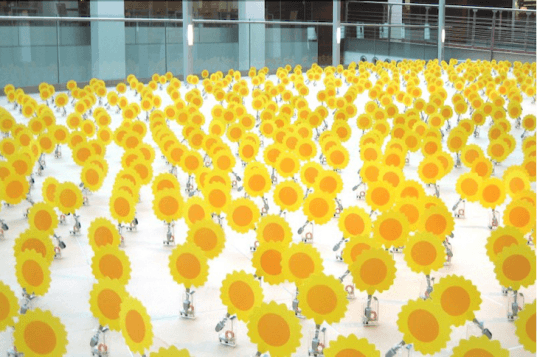 Brussels-based Alexandre Dang equips small flowers with a tiny solar panel that makes the flowers dance when they hit the sun. In this case he has created dandelions, but his numerous exhibits around the world have been comprised of all sorts of different floral varieties with as many different colors. As Zamora points out on Solar Artworks, Dang turns something that is individually quite simple into something that is complex when taken as a whole, and they are a particular hit among the kids! When you think of solar-powered art projects, it’s probably surprising to see them lit up at night like the amazing night garden by Israeli designers O*GE. 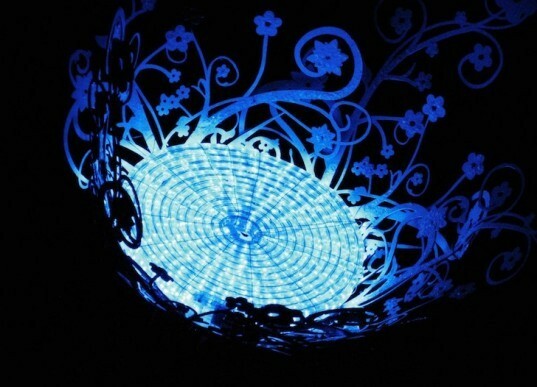 Originally shown at the Jerusalem Light Festival in 2009, this collection of flower-shaped sculptures collect energy throughout the day and then become illuminated at night – like a giant electric forest. Each of the flowers have different color lights, creating an unmatched ambience – and it’s all powered by the sun. 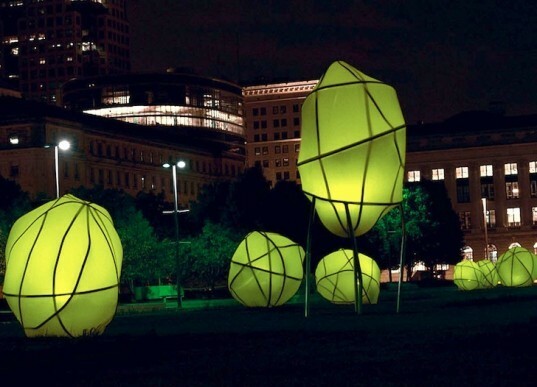 Here’s another nighttime photo of a solar-powered public art project in Cleveland by the ever-so-talented Toronto-based North Design Office. Originally a proposal for a Cleveland Public Art exhibit, The Verdant Walk consists of 7 wire sculptures wrapped in a solar fabric that collects energy from the sun during daylight hours and then light up at night. Although beautiful in its own right, what makes this really special is how vividly the project highlights the unseen potential of renewable energy. These spindly light sculptures look like they are have been struck by lightning, but actually, they are comprised of textiles integrated with solar cells called Sonumbra. Designed by the Land Art and Design Studio Loop.pH, they also have motion detection sensors that respond to human presence with an exciting spectacle of light and sound. If you ever doubted that the sun could totally rid this planet of harmful fossil fuels and that we’d be better of for it, Sonumbra is your answer! This project by Harries & Héder demonstrates what the LAGI team has been saying all along: it really isn’t necessary to create municipal energy-generating stations that are a blight on the landscape. Designed to provide light in a suburban park in Austin, Texas, Sunflower also provides shade during the day and an awe-inspiring display of the accumulated energy when the unfurled panels light up at night. This design team is particularly notorious for their public arts projects… we just wish there would be even more of them. Sarah Hall’s energized stained glass art is probably one of the most innovative ideas we’ve seen in a while. Sarah embeds pv cells between two panes of art glass that is then treated with different textures, colors, and patterns to create a dazzling array of thermally insulated solar-powered glass panels. These can be adapted to fit into window frames, facades, or they can even standalone. The Canadian artist has taken a longstanding tradition, stained glass, and adapted it to a modern context that is both desperate for planetary rehabilitation and beauty that lasts. We are glowing from all this solar goodness, and hope you are too. When you think of solar-powered art projects, it's probably surprising to see them lit up at night like the amazing night garden by Israeli designers O*GE. 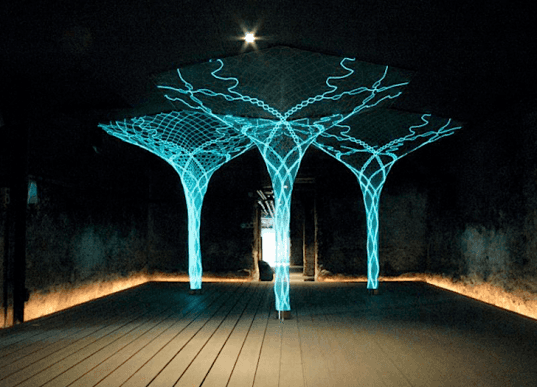 Originally shown at the Jerusalem Light Festival in 2009, this collection of flower-shaped sculptures collect energy throughout the day and then become illuminated at night - like a giant electric forest. Each of the flowers have different color lights, creating an unmatched ambience - and it's all powered by the sun. Here's another nighttime photo of a solar-powered public art project in Cleveland by the ever-so-talented Toronto-based North Design Office. Originally a proposal for a Cleveland Public Art exhibit, The Verdant Walk consists of 7 wire sculptures wrapped in a solar fabric that collects energy from the sun during daylight hours and then light up at night. Although beautiful in its own right, what makes this really special is how vividly the project highlights the unseen potential of renewable energy. These spindly light sculptures look like they are have been struck by lightning, but actually, they are comprised of textiles integrated with solar cells called Sonumbra. Designed by the Land Art and Design Studio Loop.pH, they also have motion detection sensors that respond to human presence with an exciting spectacle of light and sound. If you ever doubted that the sun could totally rid this planet of harmful fossil fuels and that we'd be better of for it, Sonumbra is your answer! This project by Harries & Héder demonstrates what the LAGI team has been saying all along: it really isn't necessary to create municipal energy-generating stations that are a blight on the landscape. 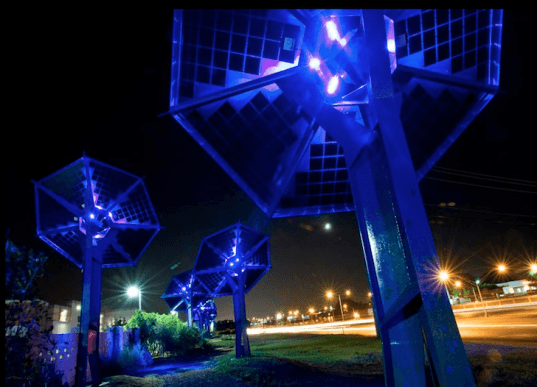 Designed to provide light in a suburban park in Austin, Texas, Sunflower also provides shade during the day and an awe-inspiring display of the accumulated energy when the unfurled panels light up at night. This design team is particularly notorious for their public arts projects... we just wish there would be even more of them. Sarah Hall's energized stained glass art is probably one of the most innovative ideas we've seen in a while. 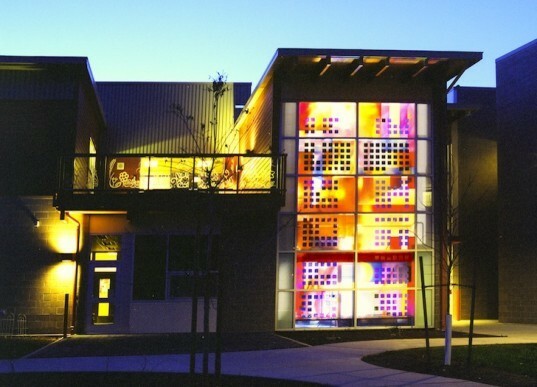 Sarah embeds pv cells between two panes of art glass that is then treated with different textures, colors, and patterns to create a dazzling array of thermally insulated solar-powered glass panels. These can be adapted to fit into window frames, facades, or they can even standalone. The Canadian artist has taken a longstanding tradition, stained glass, and adapted it to a modern context that is both desperate for planetary rehabilitation and beauty that lasts. We are glowing from all this solar goodness, and hope you are too.